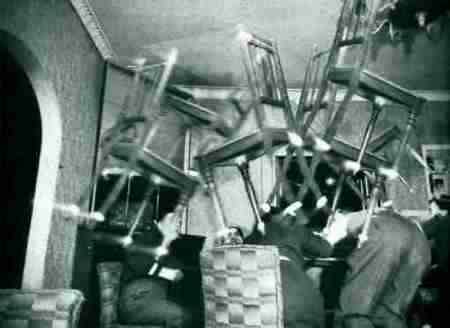 Some Poltergeist stories live on because of the sheer terror they brought into the lives of those who experienced them firsthand. For the most part, ghosts and apparitions are harmless to those who witness them, flickering briefly into view to perform some timeless task or to relay a message to a loved one, and then fading back into the unknown. Poltergeist activity, however, is another matter entirely. Seeming to center around an individual, they produce physical phenomena that has been known to cause serious harm and otherwise scare the daylights out of its victims. The meaning of the word comes from the German words for "noisy" and "spirit" and is defined as something that denotes an ostensibly paranormal phenomenon attributed to the presence of an invisible entity that manifests itself by creating noise or moving objects. They are more common than people generally realize within the paranormal world, but its up to the skeptic to decide how genuine these cases are. The most reports come from the U.S, Europe, Japan and Brazil. You can read some of the most amazing, scary & famous case studies by clicking the links below! They are very unusual and not particularly understood, due to them being very hard to actually test and experiment with. It's thought that spirits can "feed" off human energies, and this is one of the types of haunting possible as a result. There have been hundreds of independent studies done on these particular types of haunting. A majority of the cases revolve around on individual or "agent" as they are called. The phenomenon seems to be linked to a type of subconscious psychokinesis (PK energy) on the part of the agent. The studies have discovered that most of the poltergeist agents are female, under the age of twenty and are totally unaware that they are involuntarily directing the poltergeist energy. Well, there are a large number of claims about people being hurt from an encounter, mostly from people being hit by an object which was thrown. It is only logical to assume that if a force is able to move and thrown objects then it would be possible for that force to cause harm to a person if it chose to do so. The main way in which one makes itself known by is movement. There are various theories as to why this is the case, the most common of which is that the spirit just wants to express itself, very often with claims regarding the presence of one it is reported that the same item or one particular area is the focus point of the haunting, such as where a ghost haunts a certain room. They seem to have repetitive behavior, such as moving the chairs in the kitchen round into a certain way, or throwing a certain item when its placed in a particular spot, almost as if it didn't like it being there. Have something to say on this? Have A Great Poltergeist tale to tell? Do you have a great story you want to share?